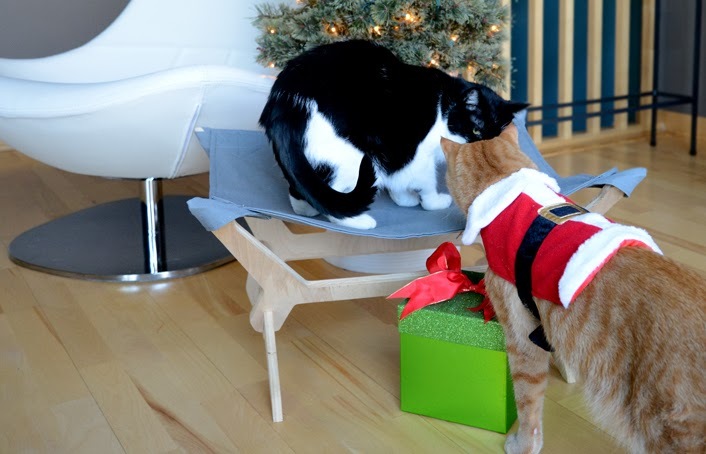 GLOGIRLY: Santa Waffles Wednesday: A Peach of a Kitty Lounger Deal – 25% Off & Free Shipping! 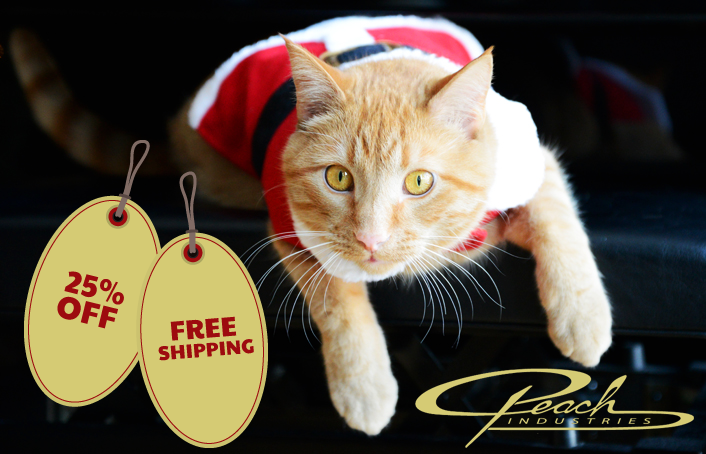 Santa Waffles Wednesday: A Peach of a Kitty Lounger Deal – 25% Off & Free Shipping! SANTA WAFFLES: Hey Boss! What's in the box? KATIE: I don't know, Waffles. I didn't put it there. SANTA WAFFLES: The ribbon matches my suit. Did you tie that bow? KATIE: I said, I don't know. I didn't put it there. You know I'm not allowed near ribbon. SANTA WAFFLES: Oh yeah, on account of that time you ate it, huh? KATIE: We don't talk about that. Maybe Glogirly put the box there. That ribbon looks like her handiwork. SANTA WAFFLES: Oh yeah, I remember. Glogirly told me the box has a special discount from our kitty lounger friends at Peach Industries. I don't know what a discount is, but I bet it tastes REALLY good! KATIE: Well you can eat it if you'd like, but I bet our friends and readers might prefer to use it on a brand new kitty lounger. Ok Waffles, do you think you can manage to tell everyone about the special kitty lounger discount? 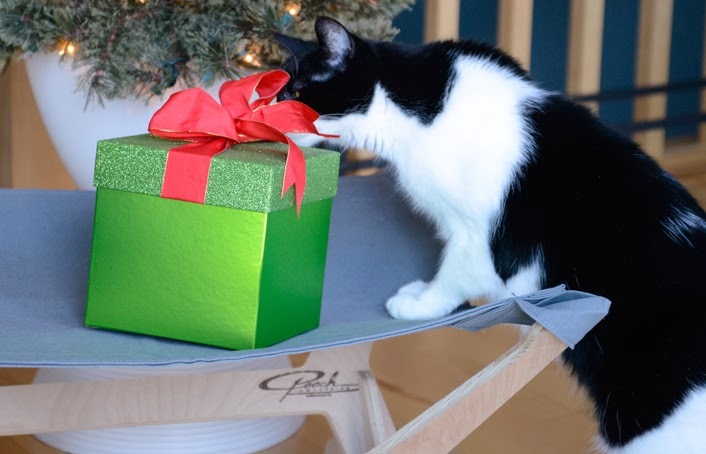 You know, without messing up or touching this ribbon? ACT NOW! Oh, wait...that comes at the end. 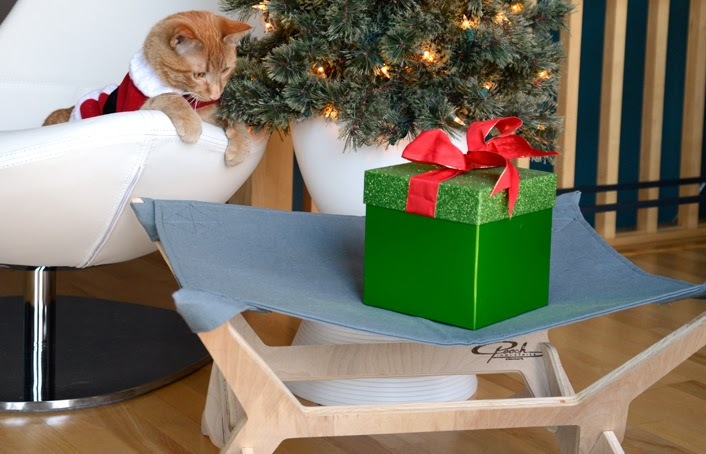 Save 25% on all Peach Industries Kitty Loungers now through Friday, December 13! AND get free shipping too! SANTA WAFFLES: I didn't forget my clothes. Look! I'm wearing my red suit! SANTA WAFFLES: Oh yeah. ACT NOW! The discounts are only good through Friday the 13th. It would probably be bad luck to miss them. You can use both codes, you just have to enter them at checkout. Offer good through Friday, December 13, 2013. FTC Disclosure: Peach Industries is a paid sponsor of GLOGIRLY. We received our kitty lounger at no charge. We also received a small fee to cover the time it takes to take photos and write the blog post. Receiving the free product and the fee did not influence our opinions. All articles on GLOGIRLY will always reflect our honest and unbiased opinions and are presented in our own voice. 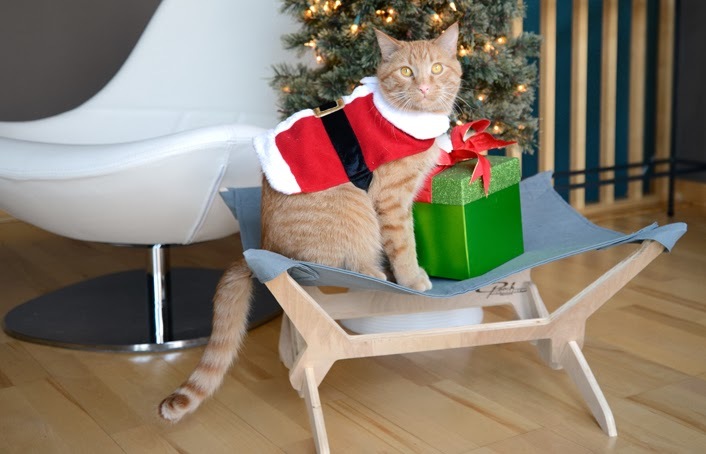 We love Peach Industries for their wonderfully crafted and beautifully designed kitty loungers. Those lounges are the ne plus ultra of cat furniture. Harry the Farm cat will second that comment Silver. He LOVES his lounger. Cool deal! But um... Waffles does not look crabilated about wearing that outfit. What is WRONG with that boy, Katie? We agree with Sparkle ... Waffles goes along with anything! Is he really a cat?!? We agree with Sparkle. Waffles looks happy to wear that outfit. Is there anything he doesn't like? Waffles, we think you actually like wearing clothes! Are you sure you're a cat?? Great offer...we'll check it out! We have the lounger on our list! The kitties here are not fond of cat beds, so this is perfect. Is there anything that Waffles won't do? He does look very cute in the suit. Good thing Katie is there to uphold the dignity of Cats. Look at your little Santa suit!!!!! That is pawsitivley adorable!!!!!!!! Is the mini hammock size the same as the larger? Is it just the height off the ground that's the difference? Waffles is just getting cuter by the minute. I'm also hiding this offer from my two otherwise Santa will be getting an addition to the list. I absolutely adore you Santa suit, Waffles! Santa Waffles you are too cute. Those loungers look so nice. Love that first and last photo although orange cats really shouldn’t wear red. Na mean? HAH! Just looked at the promo codes. I’ll have to wait to win one. Waffles that santa suit is too cute, and you wear it well! You are the perfect spokesperson for Peach Industries! Gosh, that box sure was fascinating! That looks like a comfy lounger with a great discount. You did well Waffles with just a little prompting from Katie. 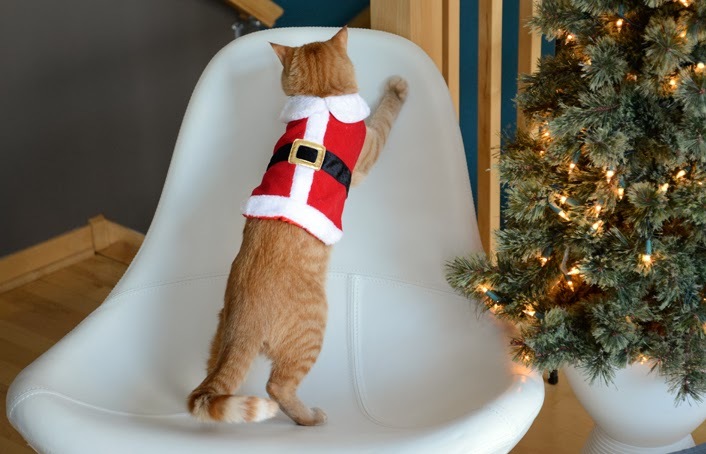 You did a great job on this post , Santa Waffles ! !